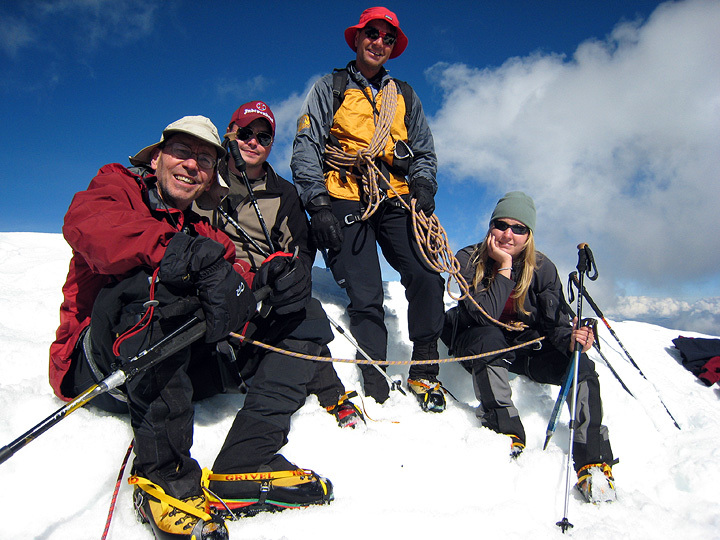 The Manning family from Gettysburg, PA joined us for a trip to the Ishinca Valley in Peru's Cordillera Blanca this May-June. 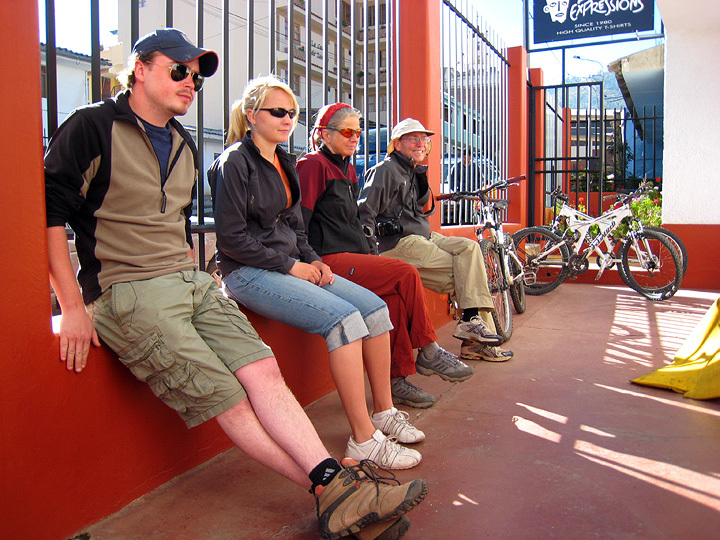 From left to right, these are Nate, Jim and Katie, getting ready for our first hike to acclimatize and stretch our legs after the long bus ride from Lima to Huaraz. 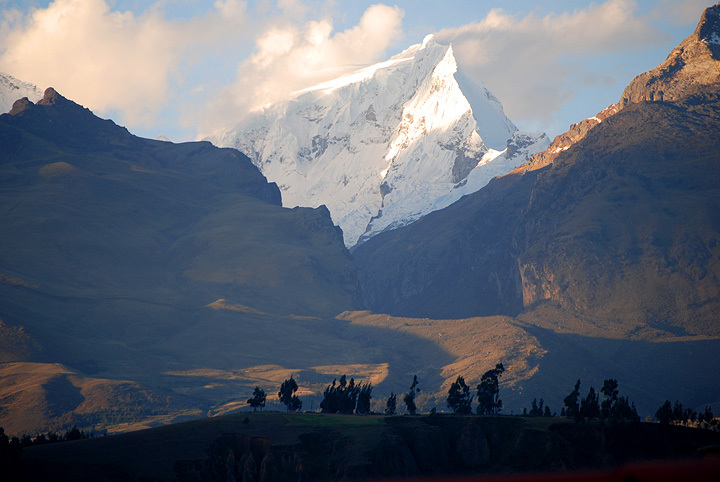 Arriving in Huaraz on our first evening, we get impressive sunset views of the nearby peaks. This tantalizing view of Ranrapalca is taken from our hotel. 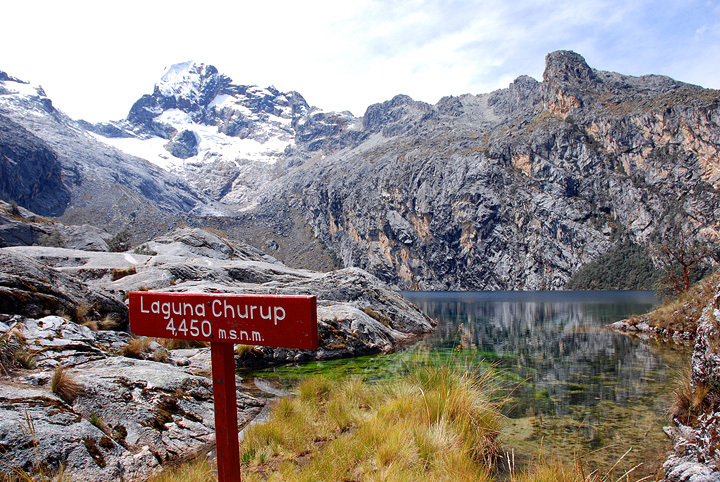 Our first day was, as usual, spent hiking up to Laguna Churup. 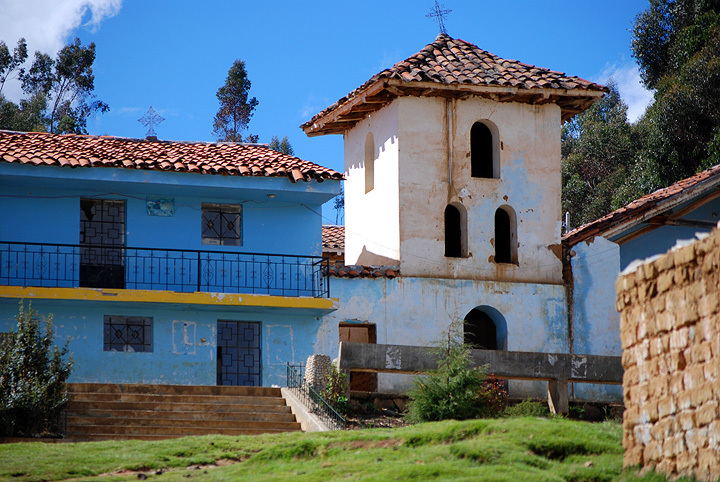 A lovely destination, accessible from town and not too high, this makes acclimatizing almost pleasant! Rock slabs above the lake make a great picnic spot. 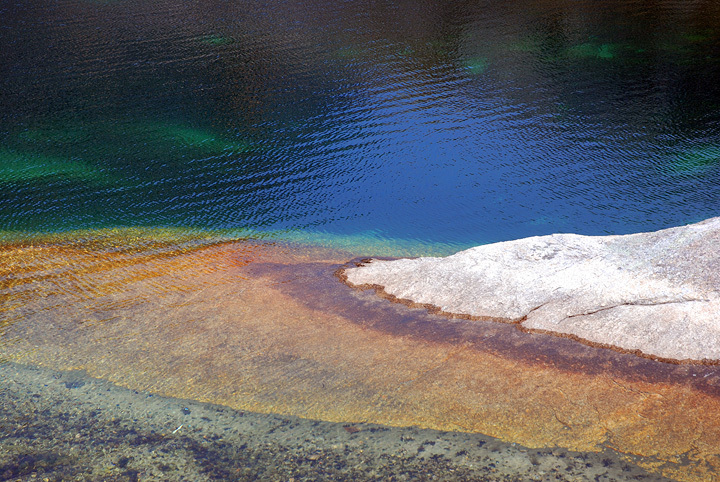 The lake's waters are well known for their clarity. The white granite rock and sand makes a mediterranean blue gleam between the darker water weeds. 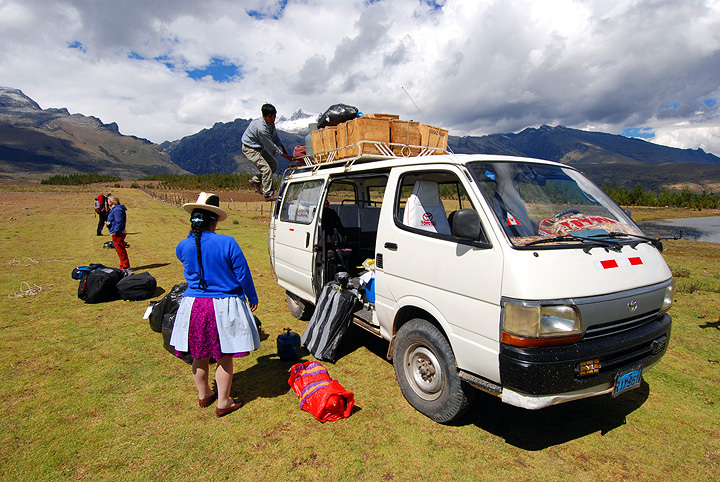 The next day we pack our truck and head for the Ishinca valley. 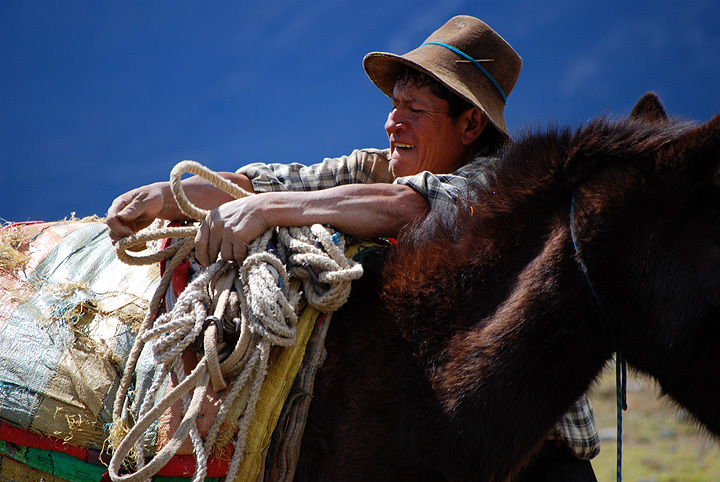 Here our driver unloads boxes for the burros to carry. 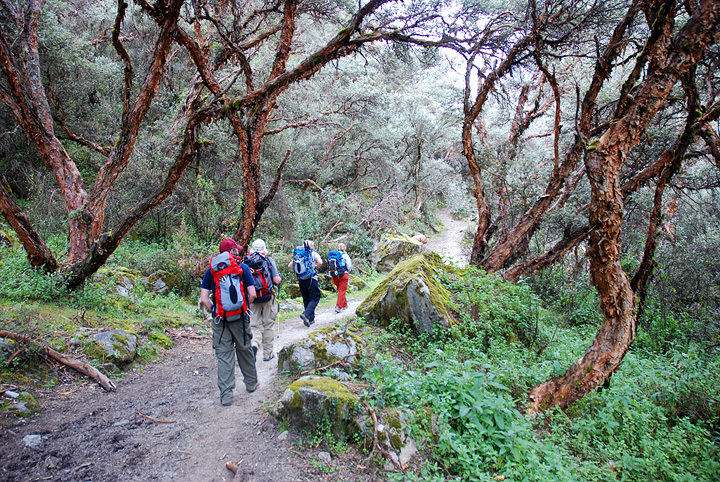 Walking ahead, we enjoy a cool trek through a forest of Queñual trees. 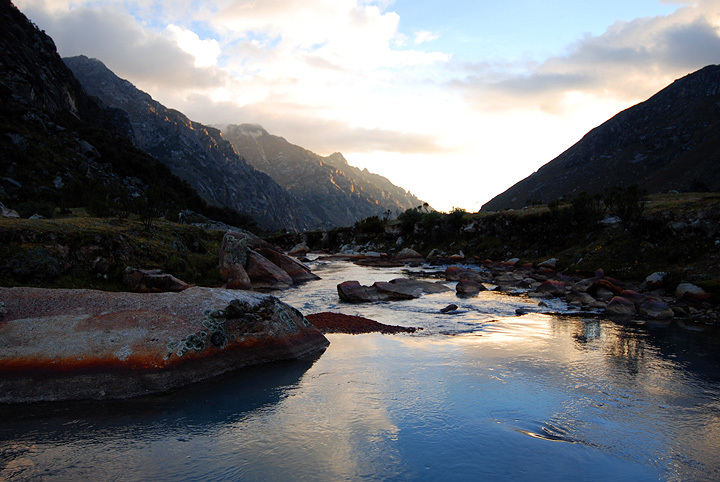 Base camp was set up between two streams flowing down from glacial lakes, a location utterly peaceful and quiet aside from the occasional midnight visits by overly social and vocal cows. 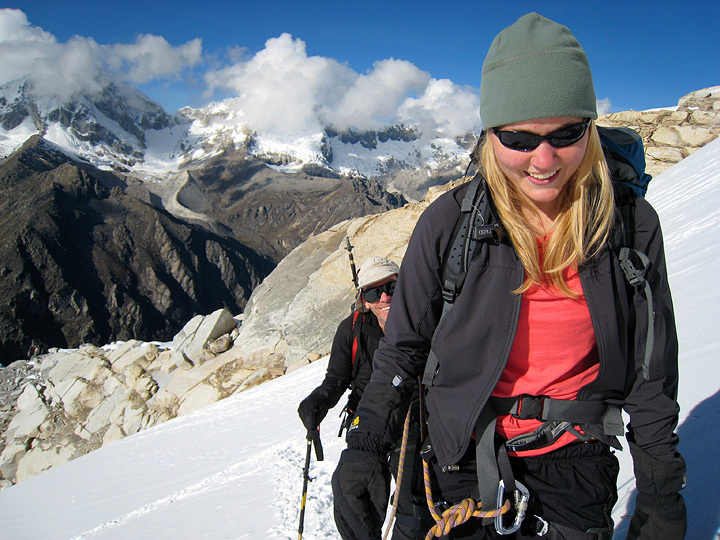 We spent a couple of days acclimatizing above base camp. 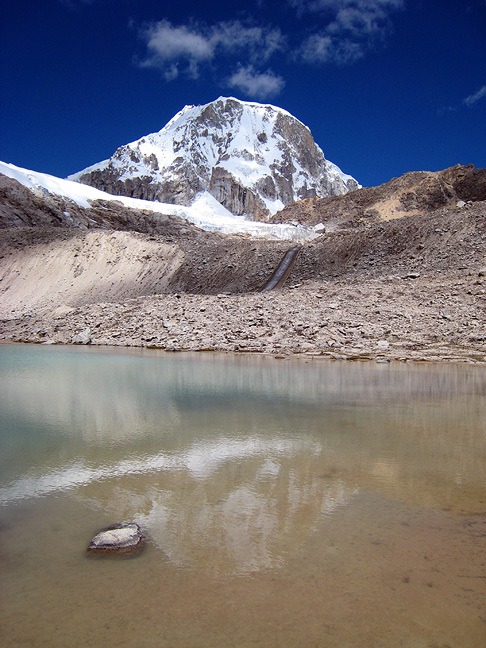 Here we arrive at a lake at about 15,500 feet, with a great view of the North face of Ranrapalca. 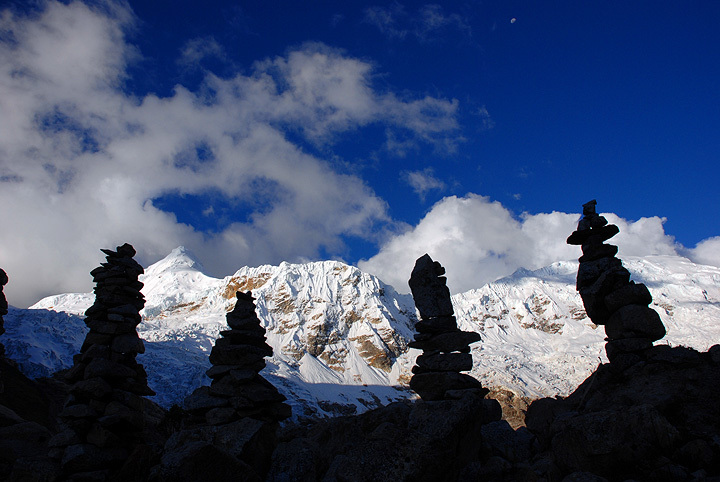 Mark commemorates the artistic cairns built on the moraine above base camp, during a solitary evening walk. 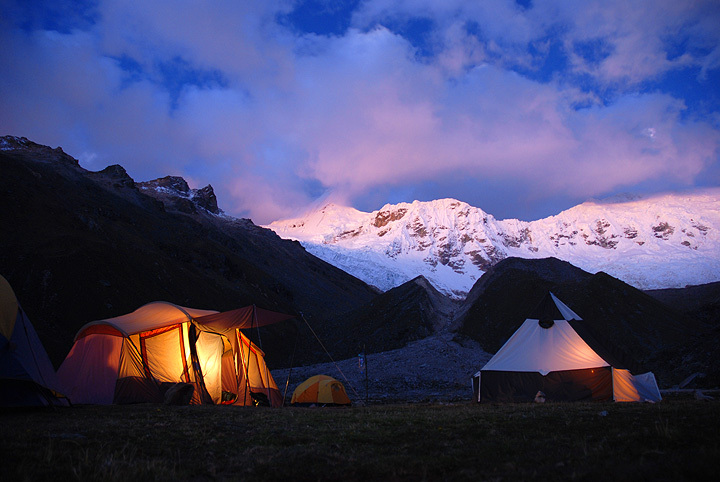 Our comfy base camp at twilight. The bright tent is our mess quarters, the black and white pyramid is Emilio's kitchen. 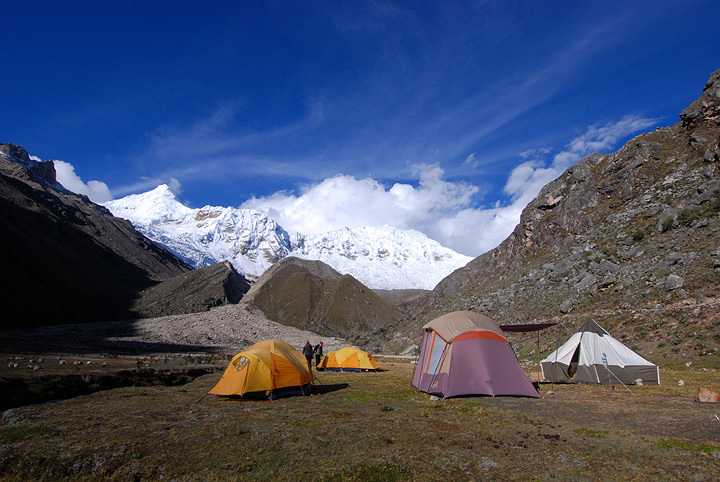 Another view of our base camp from the moraine ridge during Mark's evening rambles. 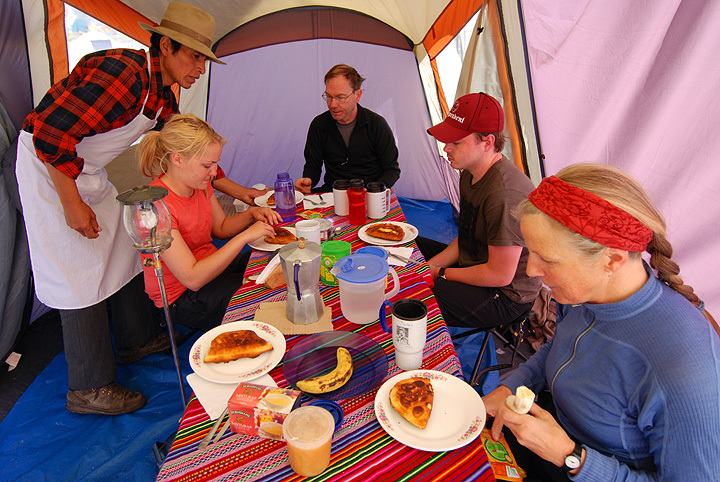 Inside the mess tent, Emilio serves up a breakfast of home-made empanadas. 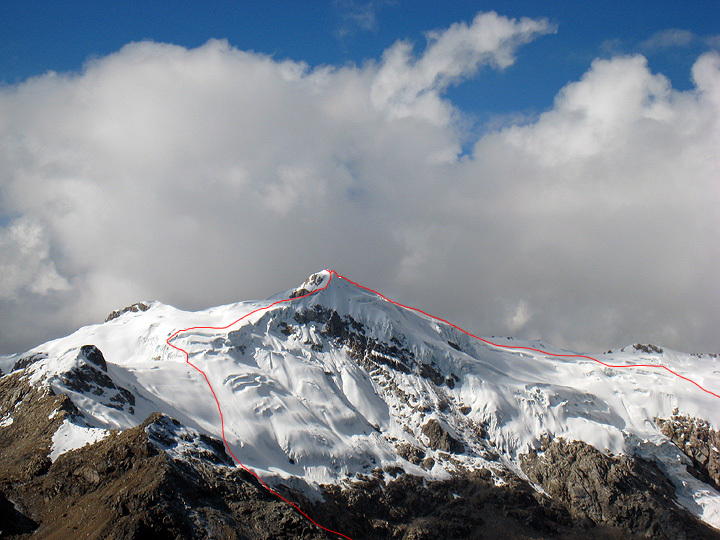 Our first climb was of Urus, the route marked by the red line here. 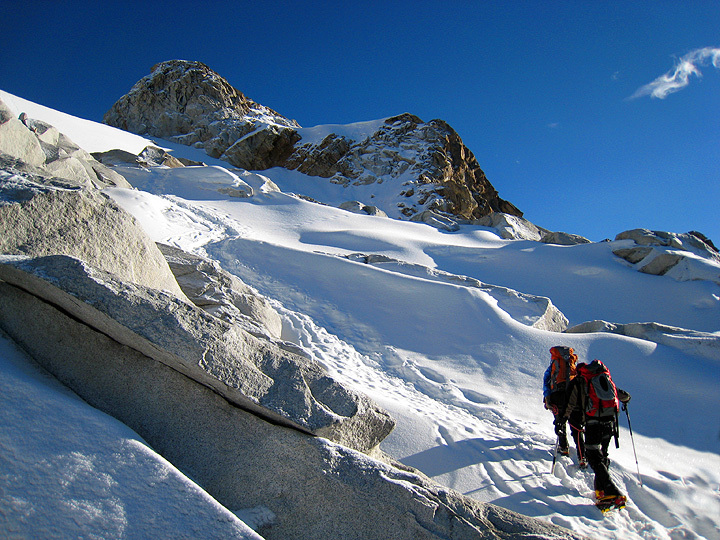 We climbed the day after a snowfall, which had dusted the nearby peaks. We had a beautiful morning in between squalls. Katie and Jim are close behind. 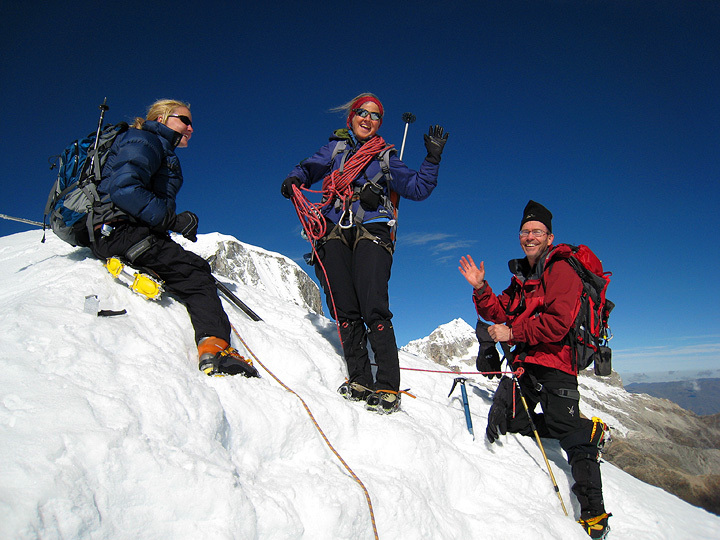 We were joined by 3 or 4 other parties converging at the summit. The weather on top was perfect, warm and almost wind-less. Heading down again, the next storm system approached from the east. 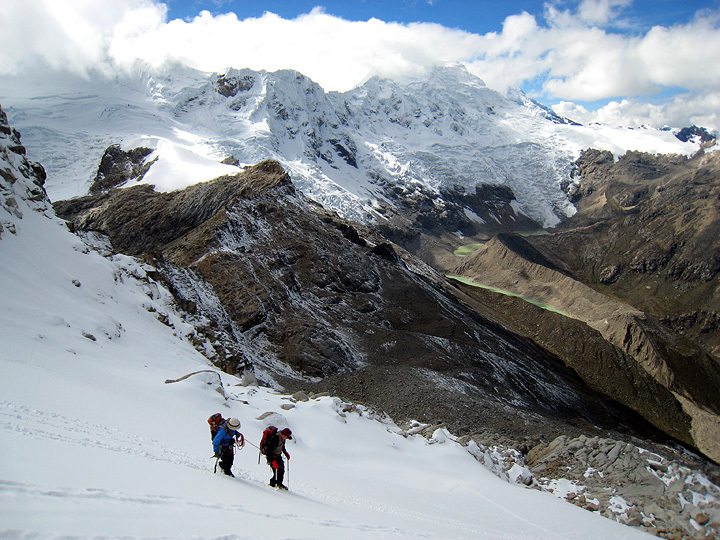 Footsore and weary but pleased, we head back down the moraine toward camp, where Emilio sees us coming and has tea ready. Rest day! After our labors the morning sunshine and lazy day is great. 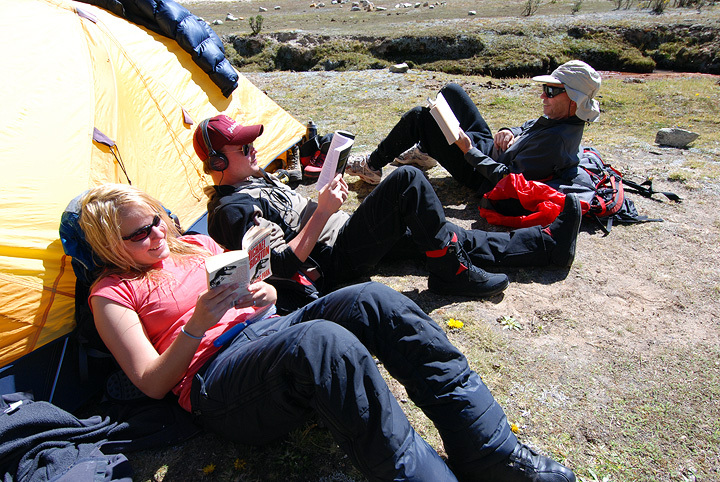 We catch up on reading and listen to some tunes. 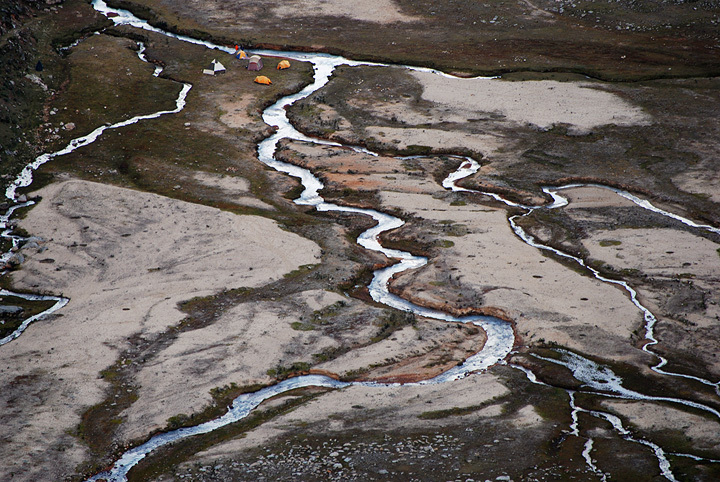 The nearby stream separates us from the rest of the camp, and provides a lulling sound to fall asleep to. 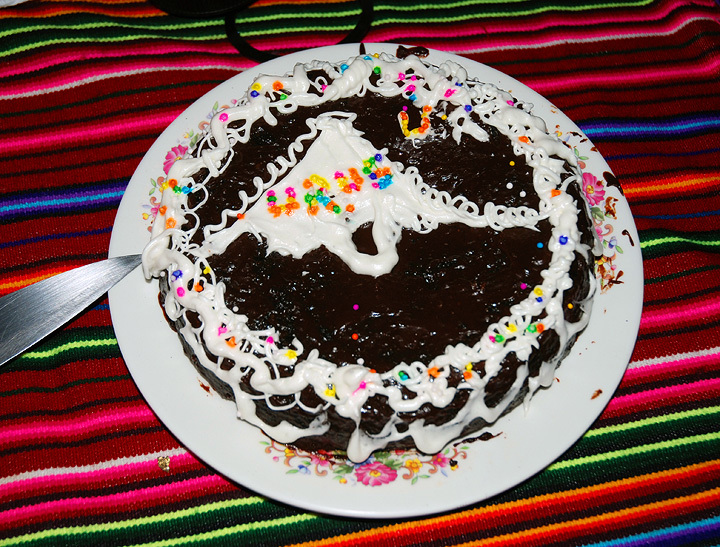 But first, a good meal, including this celebration cake that Emilio whipped up! 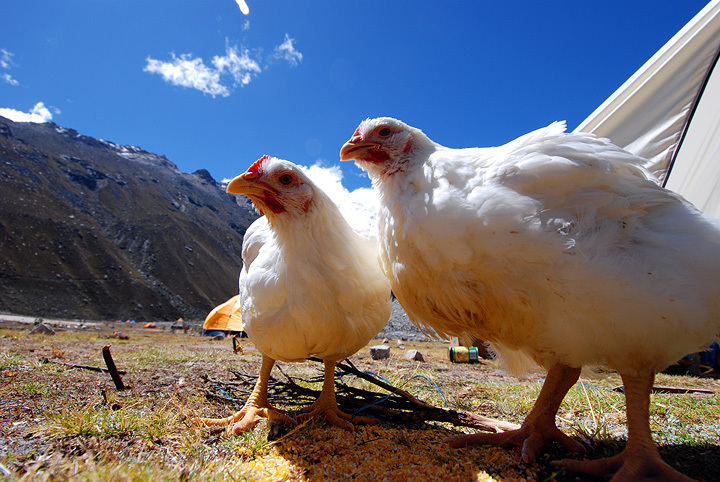 Our camp chickens (dubbed "Crispy", and "Extra Crispy" by Nate and Katie) live high off the hog for the week, blissfully unaware of the menu for the next celebration dinner! Well, they look happy enough here, and I hope they were! They certainly made us happy too. 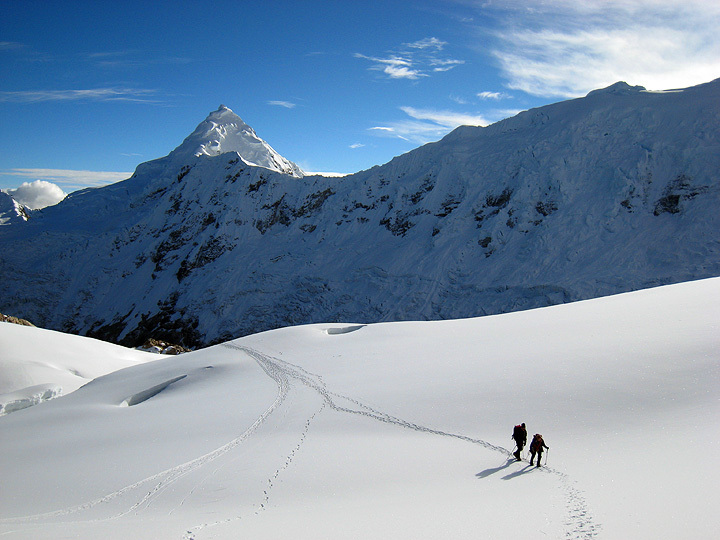 Our next climb was of Ishinca. 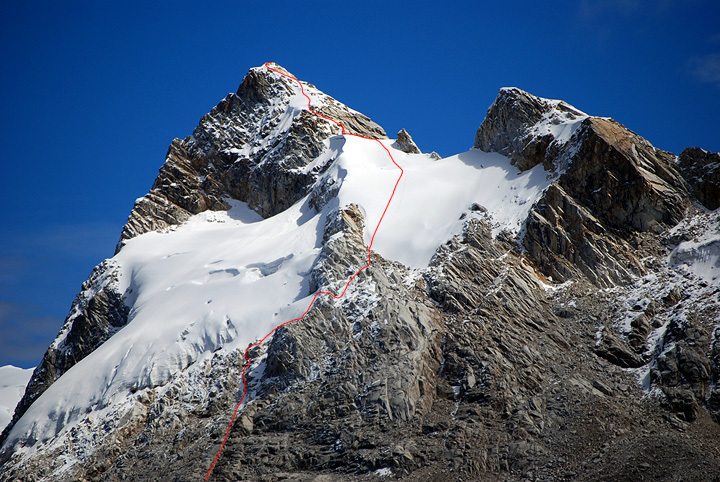 Our route traverses the peak, from left to right. 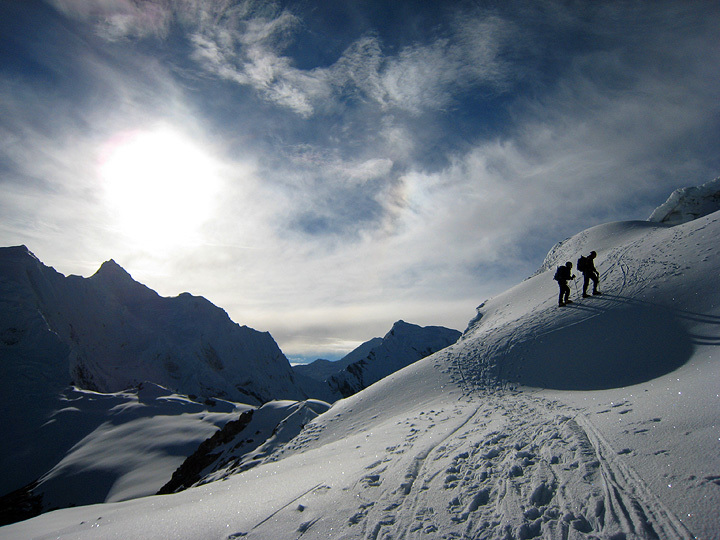 Mark and Katie wend their way up the glacier in the morning light. 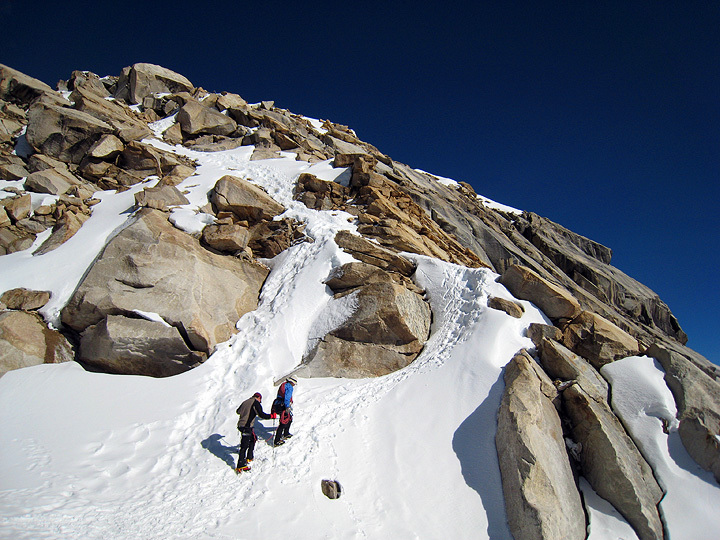 Other parties summiting ahead of us left a nice track. 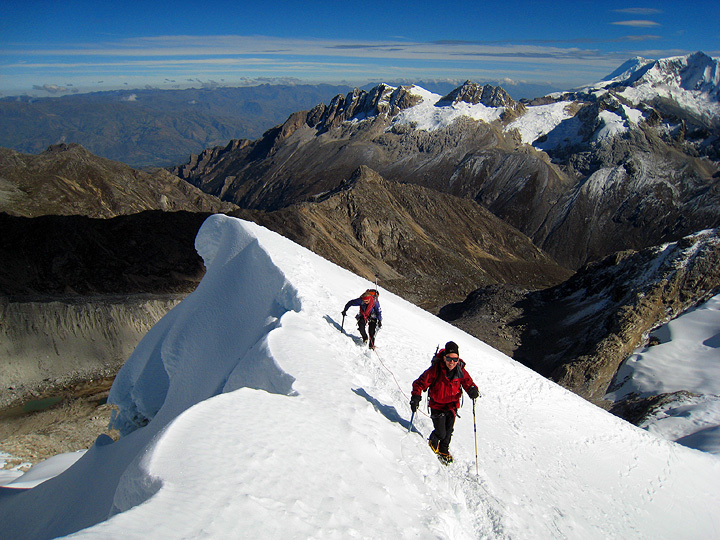 Here we approach the summit, with Tocllaraju in the background. 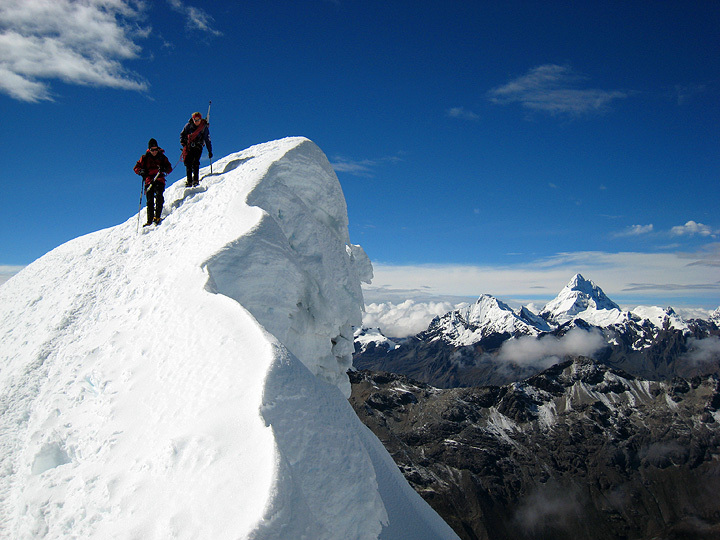 ...followed by a few easy steps to the top. 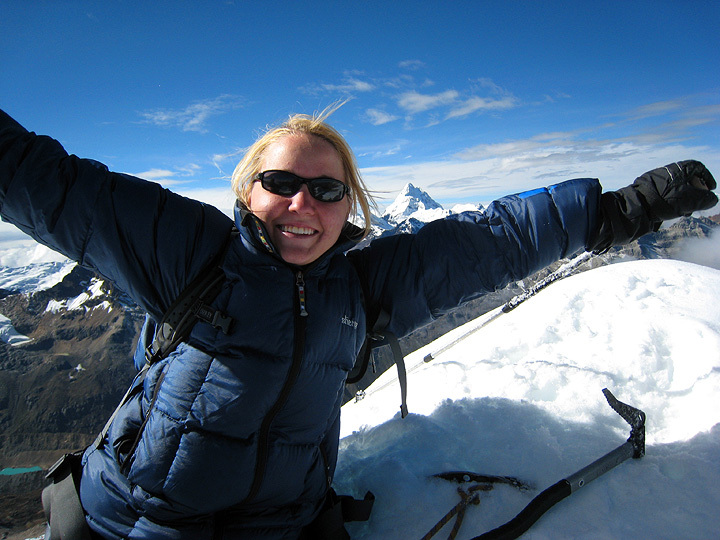 Katie enjoys the view from the top, and a feeling of achievement. 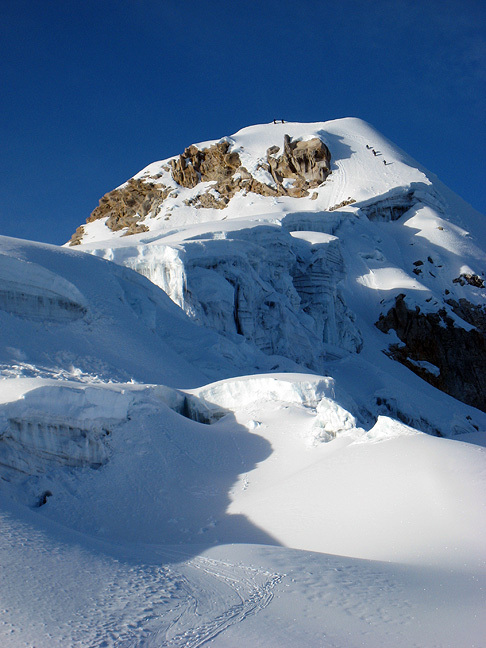 Over her left shoulder, Huantsan appears to the Southeast. 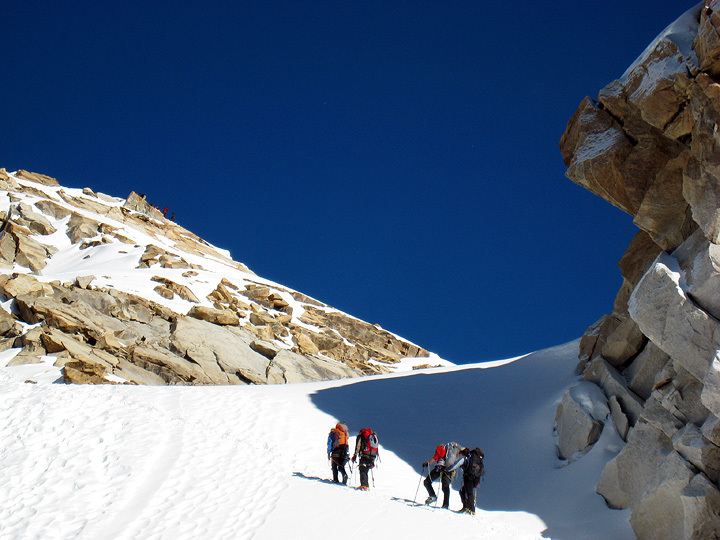 And we head down again. Another view of Huantsan in the background here. 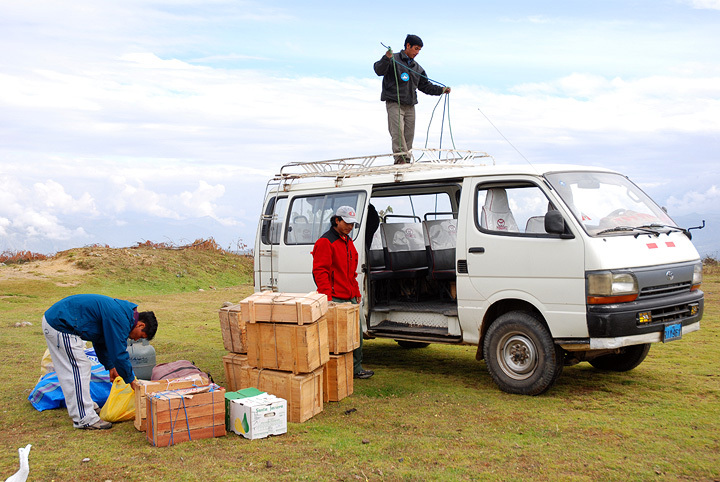 Packing up our loads, it's time to head back to town. 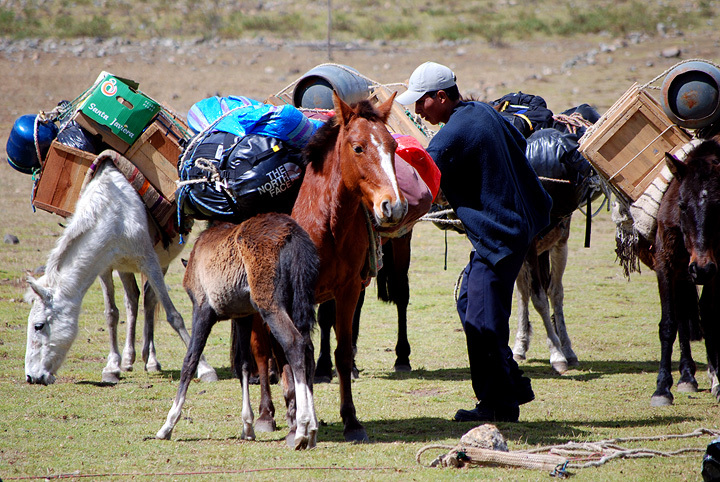 Loading and unloading animals looks like a tough job sometimes. Rosalina (Emilio's wife) and Pedro (their brother-in-law) meet us at the road end, with a warm picnic lunch as well as the van. This is the square of the town of Pashpa, near the road-end. 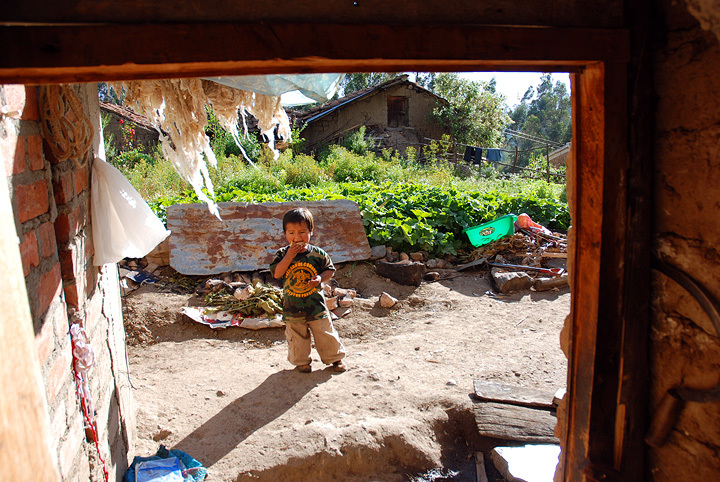 And this, a view of Emilio's farmyard, and great-nephew Antoni, during our "Pachamanca" at his house in Llupa. 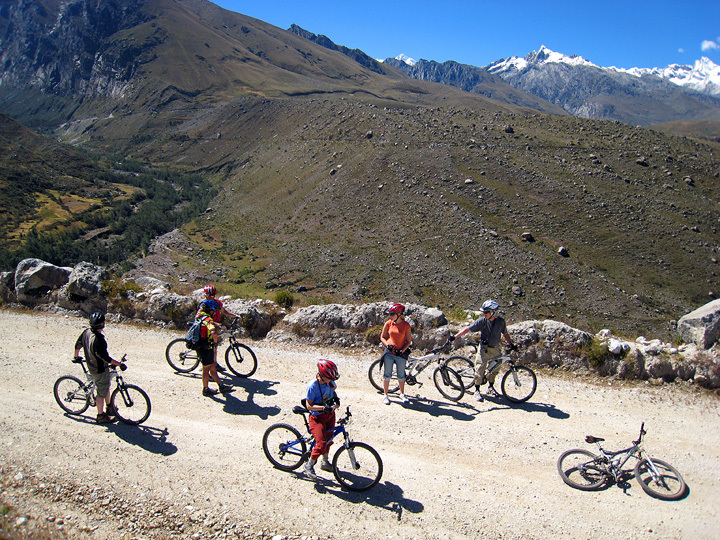 We took advantage of a couple of extra days in Huaraz to try some "extra-curricular" activities, such as mountain biking. 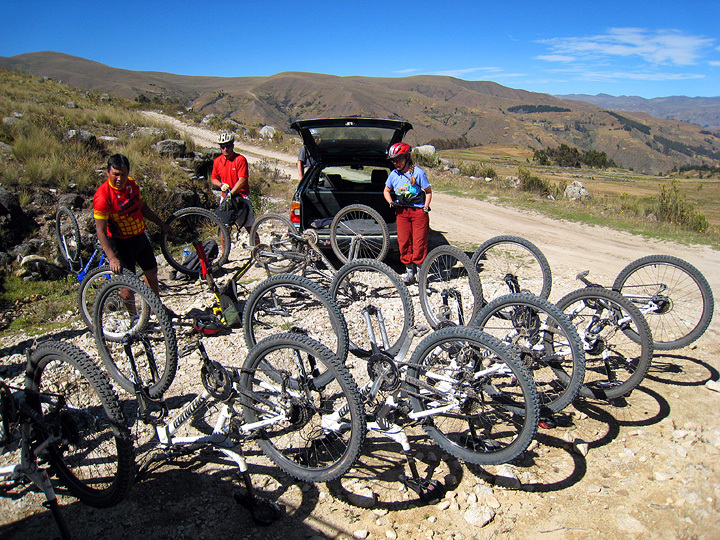 Here we wait while our guide Julio Olaza selects bikes for us. He had great, top of the line bikes for us to ride, and picked a good route for a morning's outing. 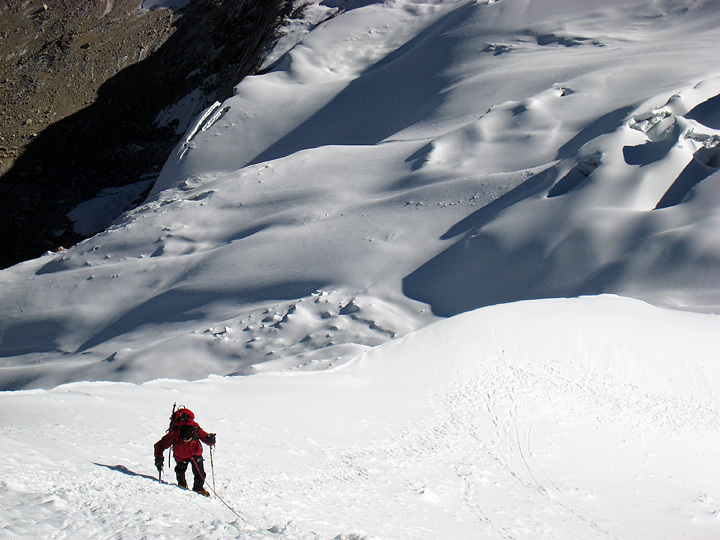 We were driven to near Pitec for the start of our descent. Arturo puts the bikes back together and oils the chains. Our route was mostly downhill on a good, easy road. 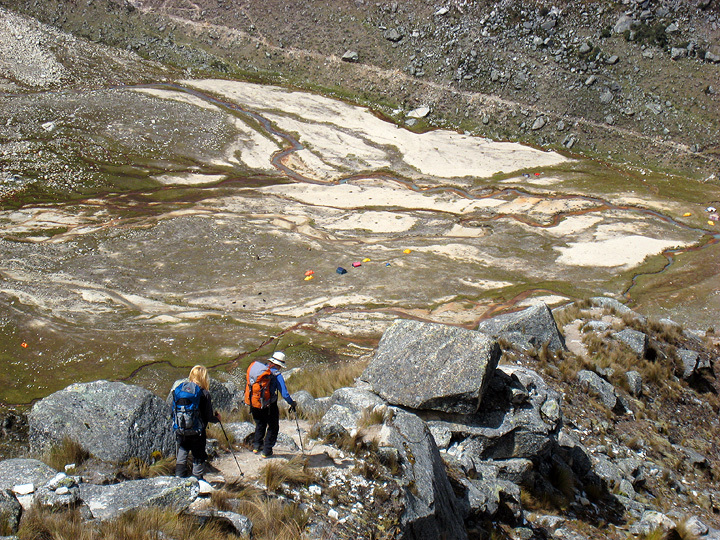 Occasional loose rocks were our only concern. The views were great! 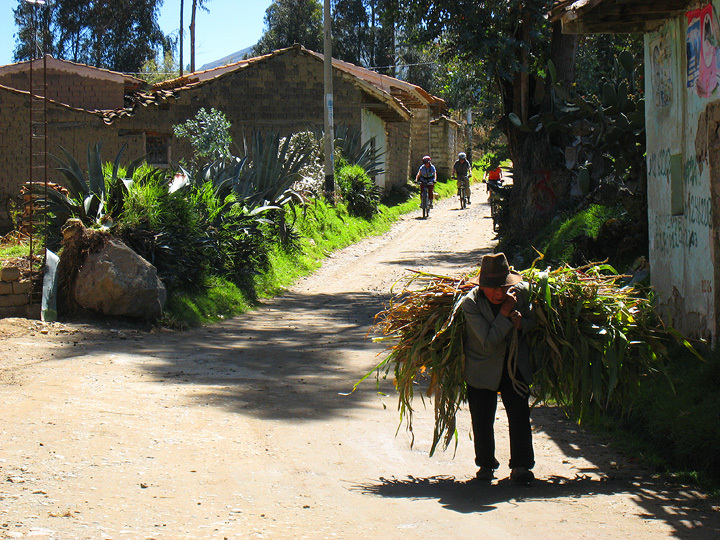 Wandering through villages and passing by the pre-columbian site of Wilcahuain, we reenter the outskirts of Huaraz. 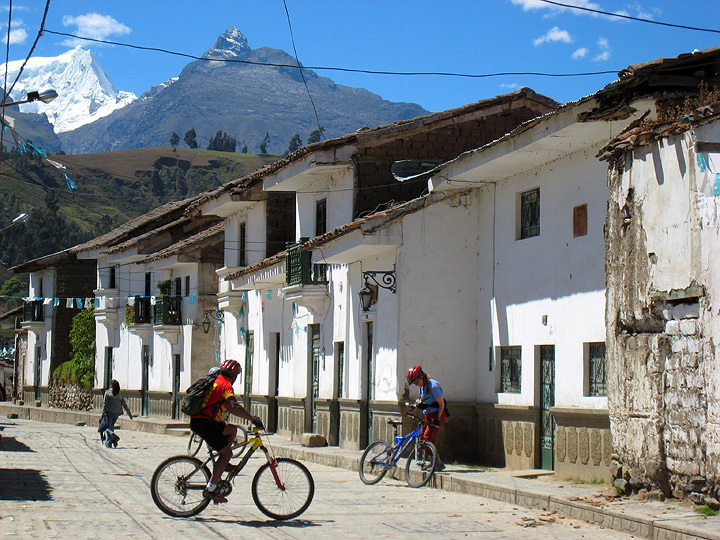 Our route finishes in the "old city" block of Huaraz, the only part of town that survived the 1970 earthquake. On our last day, we checked out rafting, but opted not to bring our cameras (a good idea as it turned out; Kathy went in the drink!). 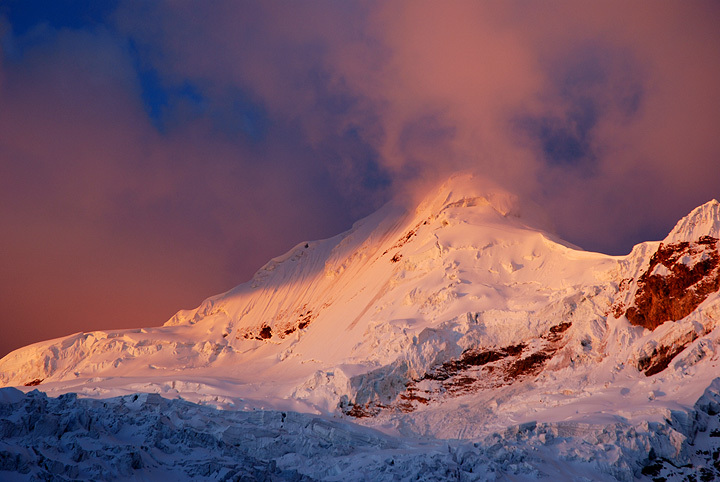 So we leave you here with this shot of Tocllaraju at sunset. We'll be back next year we hope!